Dyson, the UK maker of vacuum cleaners, fans and hand dryers, has reported record annual turnover of over £1bn, led by US and Japanese sales. 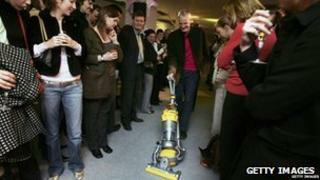 The company, founded by Sir James Dyson, said on Friday that its turnover was £1.05bn, up from £887m in 2010. Its earnings grew by 30% in 2011 to £306.3m. Dyson said it had seen "robust growth" in the US and Japan, and is set to start selling its products in China from November. The company said it considered China remained a "significant growth opportunity". Dyson has been increasing the amount of products it sells outside the UK. Last year it sold 85% of its machines outside the UK, compared with 30% in 2005. The company said it was now the top selling upright vacuum cleaner brand in the US, with a near 27% market share. Dyson - which now employs nearly 4,000 people worldwide - also said that it planned to increase its spend on research and development by 20% over the next five years.